2. In a large mixing bowl, stir together the eggs, both sugars, vanilla extract, corn syrup, baking soda and salt. Then stir in the melted butter and peanut butter, followed by the oats and flour. Lastly, stir in the chocolate chips, Reese's pieces and M&M's. Let the dough rest for 30 minutes. 3. Drop the dough by ¼ cupfuls onto baking sheets (if weighing, each ball of dough was approximately 2.7 oz or 77g). Use your fingers to flatten the dough slightly. Baking for 10-12 minutes, or until the cookies are a light golden brown. Cool on a rack and then store in an airtight container at room temperature. 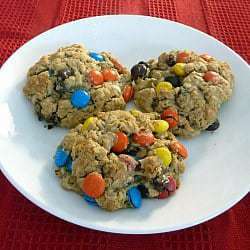 *Note: I found that since I used both M&M's and Reese's Pieces, some of the candy pieces fell out when scooping the cookies if a particular ball of dough was overrun with both. Not a big deal, just know that you might lose some candy.